Speaking at the India Today Conclave last evening, she said sports and education are the two pillars on which 'India tomorrow' will rise. 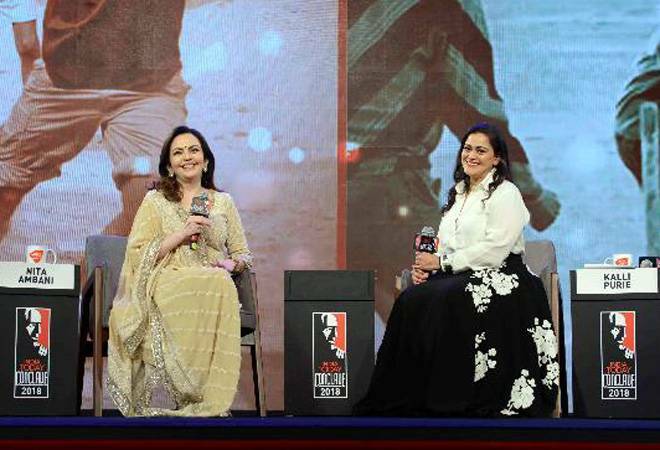 With her husband Mukesh Ambani, Reliance Industries Chairman and Managing Director, in the audience, she delivered a talk titled 'The Great Equaliser: Sports and Education For All'. "Even the world's best and biggest companies have a finite lifespan. But educational institutions are timeless. They live and breathe and grow in the generations whom they empower," she said. And that is why, Reliance Foundation is planning to set up a world-class university, she said. "A university at the cutting edge of research and innovation. A university that focuses on education and sports, art and culture," she said without giving a timeline for setting up of the institution. The university, she said, will collaborate with the top universities around the world and prepare future generations to face the world, with knowledge and skills. "A university from the gates of which will emerge our future leaders, our musicians, our scientists, and our Olympians," she said. "Building such a university is our dream at Reliance Foundation." Reliance Foundation was set up in 2010 to provide impetus to various philanthropic initiatives of Reliance Industries, the country's biggest private firm. Ambani said India is home to one sixth of humanity and half of its population is under the age of 25. "One-fifth of all young people in the world are Indians. In the next two decades, while the world ages, India is poised to become younger. India's youth will build India's tomorrow," she said. "Mukesh and I have a big dream and a firm commitment - To make the Right Education, and the Right to Education available to all." Ambani went on to detail her organisation's efforts to contribute to the development of sports and education in India. Reliance Foundation has established 14 schools, educating over 16,000 children annually. "Our newest two schools are in Uttarakhand. These are the schools that were completely destroyed during the floods in Uttarakhand in 2013, which we have rebuilt now," she said. Stating that scarcity of quality teachers and the lack of infrastructure continue to be India's major challenges, she said creative and quality content as well as innovative and cost-effective methods are the need of the hour. Her foundation's grassroots programme had reached out to 13 million budding sportspeople and athletes, she said narrating inspiring stories of young boys and girls who dared to dream and succeeded. She spoke of Anju Gurjar, a young athlete who received a marriage proposal at the age of 15, but won a competition held by the Reliance Foundation and then went on to compete at the national level. She also spoke of the Pandya brothers, Kunal and Hardik (of Mumbai Indians fame), and their humble beginnings.